Chipping Norton is the highest town in Oxfordshire, situated on the western slopes of a hillside that was once the site of a Norman castle. 'Chipping' is derived from ceapen, an old English word meaning market. Alternatively the meaning comes from the medieval word Chepynge meaning long Market Square as will also be found at Chipping Campden and Chipping Sodbury. There has been a market here since the 13th century and was a major wool-trading town in the 15th century; the great 'wool' church of St Mary, built in perpendicular style, testifies to its prosperity. The church has one of the finest interiors among the great Cotswold churches. The slender supporting pillars and the clerestory windows form an almost continuous band of glass above the nave to give the church a feeling of great height and lightness. The church is also noted for its unusual hexangonal porch with vaulted ceiling. 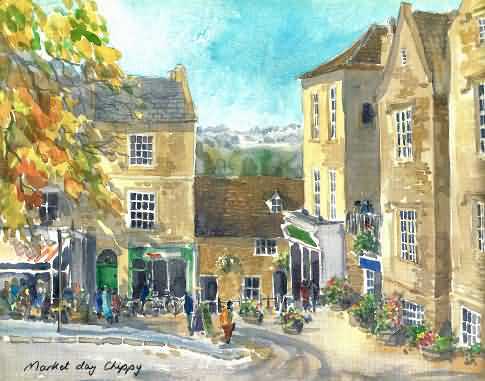 The lively little town has a vibrancy about it, but remains unpretentious and the everyday lives of those who live and work there have so far not been overshadowed by the effects of tourism - in other words its a 'real' Cotswold town with 'real' shops and fondly known as 'Chippy' to the locals. It is also known, importantly, for having the last fish and chip shop for 30 miles in the Cheltenham direction. Chipping Norton offers the visitor plenty of retail therapy including several antique shops and a wide selection of restaurants, Inns and Pubs. Until not too long ago 'Chippy', apart from being a small market town, had a real industrial base in wool and tweed production. Just outside the town stands Bliss Tweed Mill, designed by George Woodhouse, it looks like a cross between a mansion and a folly, rather than a late 19th century factory having an unusual domed based chimney which is a landmark for Chipping Norton from miles about. Tweed of high quality was made here for many years. The owner William Bliss was instrumental in bringing the railway here to supply coal for his mill's steam engines. 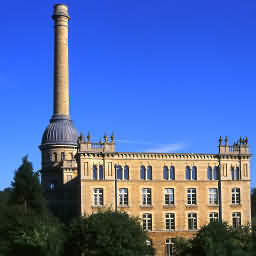 The Mill finally closed in 1980 and has now been converted to luxury apartments. The town's railway and it's station closed in the 1960s. Henry Cornish, who died in 1650, was the founder of the almshouses. Named in Chipping Norton's Royal Charter of 1606 as one of the first members of the new Corporation which was to govern the town, he was clearly a man of property and considerable social standing in the community. In spite of this wealth his private life had many sadnesses. In about 1600 he married Sarah Browne, daughter of Thomas Browne who built Fletchers House in Woodstock (the present county museum), but although they had twelve children no fewer than ten died in childhood, and the remaining two only lived into their thirties. There is a pitiful brass plate at the back of St Mary's church commemorating the death of a son, named Henry after his father, who died aged nine. The lack of surviving children was one reason why he left such generous bequests to the town.The other was his strongly held puritan belief in charity to the poor. The almshouses were provided at his own expense for eight aged widows who had to be of honest and godly life and conversation: In addition, he left money to provide coats and gowns for two poor men and two poor women, and fourpence each to 40 other widows. He bequeathed 12 other cottages around the town to be let to honest people who could afford to rent them, but stipulated that the rents should never be increased. At the other end of the social scale he also gave his fellow members of the corporation, the'Bailiffs and Burgesses of Chipping Norton; money for an annual dinner at the White Hart (then the leading inn in the town) which became known as The Bailiffs Feast, and was held for nearly two hundred years after his death. Chipping Norton's Town Hall is a proud symbol of the days when the town was a Borough, and still dominates the heart of the town. During its 161 years it has seen many changes. It was originally built on arches with the entrance to the main hall and the Council Chamber up the broad flight of steps on the eastern side. Beneath were four lock-up cells for prisoners of the Borough as well as space for a weighbridge and fire engine. Until the opening of the railway the weighbridge played an important part in the economy as coal was brought from Banbury by cart and weighed before delivery. The poultry and butter market was held here on Wednesdays. Up to 1857 meetings of the Corporation and proceedings of the Borough Magistrates were held in the Council Chamber. The Hall was occupied on Wednesdays as a Corn Exchange. It was also used for auctions and entertainment. Previously these functions had been held in the White Hart. The weather vane, a foxhound, was given by the Heythrop Hunt. In March 1950. There are four portraits in the Upper Hall. On the left is Alderman Wilkins who was Mayor in both 1837, the year of Queen Victoria's accession, and in her Golden Jubilee year - 1887. Next is Albert Brassey, the first to be Mayor and MP since the Charter of 1606. To the right is his wife and JH Langston, who was important in the initial plan to build the Town Hall. The Town Hall is licensed for marriages. The Main Hall and the beautiful rooms on the lower floor are available for receptions and meetings. Chipping Norton Museum is an independent museum run by the Local History Society. Open from Easter until end of October on Monday to Saturday & Bank Holiday Mondays 2pm to 4pm. Entrance £1 Children free but must be accompanied by adult. You will find the entrance to the Museum opposite the Town Hall steps. Among the many exhibits are: Prehistoric and Roman artefacts - A display of Farming Equipment - Chippy at War -"Granny's Kitchen"- Chipping Norton Baseball Club - A valuable collection of more than two thousand postcards of local places and events - Reference section for Family History Research. 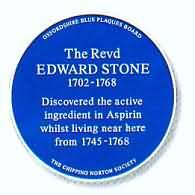 Edward Stone, a vicar from Chipping Norton in Oxfordshire, is generally recognised as the man who gave the first scientific description of the effects of willow bark. In 1763 he wrote a letter to the Earl of Macclesfield, then president of the Royal Society in London, in which he describes treating patients suffering from ague (fever) with 20 grains (approximately a gram) of powdered willow bark in a dram of water every four hours. Stone's interest in willows was due to the ancient "Doctrine of Signatures" - whereby the cause of a disease offers a clue to its treatment. According to Stone: "As this tree delights in a moist or wet soil where agues chiefly abound, the general maxim that many natural maladies carry their cures along with them, or that their remedies lie not far from their causes, was so very apposite to this particular case that I could not help applying it; and that this might be the intention of Providence here, I must own, had some little weight with me." It is highly unusual for a town the size of Chipping Norton to have a theatre - it provides an eclectic programme of live theatre, music, dance and comedy, culminating in the famous annual pantomime, which attracts visitors from across the globe for its charm and tradition. The Theatre also screens a wide range of contemporary, classic, art house and foreign language films throughout the year. 1888 : The building that now houses The Theatre started life in 1888, as a Salvation Army Citadel. On the 3rd August 1888 Commander Herbert Booth and Major Oliphant laid the foundation stones for the Citadel, which can still be seen on the front of the building and inside the auditorium, with the following inscription: "These stones were laid by 100 of those who through great persecution boldly and conscientiously served their God"
1962 : The Salvation Army left the Citadel in 1962 and it was used for some years as a furniture warehouse. 1968: John and Tamara Malcolm, two Royal Shakespeare Company actors, moved to Chipping Norton. They discovered the now deserted citadel and recognised its potential. The building was designed and constructed by the engineers who built the Victorian Music Halls and, although small, was perfect in proportion and acoustics. 1973 (September) The Malcolms learnt that the citadel in Spring Street was for sale. Within two days, they persuaded an anonymous benefactor to loan them the money to buy the building and submitted an application for planning permission to convert it into a theatre. Cash for the project began to pour in from fund-raising ventures. In December 1973, The Theatre presented its first professional Christmas show, four performances of ' The Beauty and the Beast' at Chipping Norton Town Hall and in April 1974 a charitable company was registered to run The Theatre. 1974 (June) West Oxfordshire District Council granted full planning permission for the conversion of the Citadel. A grant from the Gulbenkian Foundation in the same year enabled The Theatre to purchase the cottage adjoining the Citadel for conversion into a bar and gallery. With the help of grants from the Arts Council, the BFI and the Pilgrim Trust and many individuals, scores of Chipping Norton volunteers laboured to convert and equip the buildings. 1975 (29th August) The Theatre opened its doors for the very first time. Initially only showing films, The Theatre's programme soon expanded to include professional theatre productions, classical and folk music and Old Time Music Hall. A highlight of the year was, and still is, The Theatre's own pantomime. 1990 , 7 Goddards Lane (around the corner to The Theatre) was purchased. This provided a daytime box office, new dressing rooms, a green room for artists, a large rehearsal room and new administration offices, all linked to the Spring Street building by covered walkway. On 2nd April 1993, this extension of The Theatre was completed and officially opened. 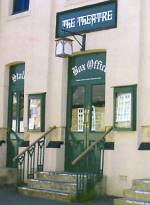 1996 The Theatre, Chipping Norton was one of the first theatres to receive money from the National Lottery and in October 1996 reopened after 6 months extensive refurbishment. The Spring Street (evening) Box Office was rebuilt and the foyer space improved, new toilets featuring specially commissioned tiles by Brian Elliott and Sue Ayres and facilities for the disabled were installed and the bar area was increased. Improvements to the Auditorium included - better access to balcony, side balcony benches were replaced, a new control booth for stage management and film projection was constructed, an induction loop system installed for the hard of hearing and 3 new rows of seating were added. The roof was raised over the stage area and wings, then squared off to enable the full width of the space to be used. All these improvements enabled the Theatre to host larger companies, extend runs of shows and present a dance programme. As part of the Lottery refurbishments, Graham Rust was commissioned to paint murals in the bar and stairwell area. This was his first public arts commission received by Graham in this country. 2000 (June) Tamara Malcolm was awarded an MBE for services to theatre. 2002 (October) Caroline Sharman joins Chipping Norton Theatre as Artistic Director. Address - The Theatre 2 Spring Street, Chipping Norton, Oxfordshire, OX7 5NL. Parking: There are free public car parks in New Street, High Street and Albion Street, with varying time limits. Nearby Attractions: Chastleton House, Chipping Norton Museum, Blenheim Palace, Rollright Stones, The Theatre at Chipping Norton, Rousham House, Rousham Gardens. Ditchley Park: Located 9 miles from Chipping Norton south towards Woodstock and home of the Ditchley Foundation and former home of celebrated Interior Designer of the "English Look" - Nancy Lancaster. Located at Enstone, Chipping Norton, Oxfordshire, OX7 4ER. The Ditchley Foundation was established by Sir David Wills in 1958 to advance international learning and to bring transatlantic and other experts together to discuss international issues. Sir David's original objective was to promote Anglo-American understanding. American and Canadian sister Foundations, set up in 1964 and 1981 respectively, remain our most active partners. Since then Ditchley conferences have broadened to include the concerns and participation of nations all over the globe. Ditchley's unique quality is derived from the beauty and relaxed atmosphere of Ditchley Park in Oxfordshire Cotswolds, one of southern England's finest country houses, and from the warmth and informality of its gatherings. A complex world needs fresh ideas flowing from open minds: this is Ditchley's hallmark. Winston Churchill used to spend his weekends here during the Second World War, when the danger of bombing prevented him going to Chequers or Chartwell. It is close to his family home at Blenheim Palace at Woodstock. Ditchley Park is available for conference and away-day hire and tours are available for groups. W: www.ditchley.co.uk.